On my coast of Maine cruises I've often been assigned a transient mooring for a night that, when I arrive and find it, sometimes is "bald" -- there are no pennants, ring, or any way to easily tie up to it, only a large bare ball floating in the water presumably attached to a chain beneath. The first time I encountered one of these (the Five Islands Harbor Yacht Club's four or five courtesy transient moorings) it initially threw me. Once I realized there were no pennants to grab or ring to run a line through, I let the ball go and circled around long enough to tie a lasso on the end of a dock line (passing the running end through its eye splice loop), then roped it on the next approach. With the lasso taut around the mooring chain beneath its ball it was secure, but this made loosening and releasing the loop on departure very difficult -- the option was leaving my dock line behind, so I wrestled it free in the end. Never again! I devised a better method. Ever since, when I run into the "bald mooring" situation (and it's more common than I'd have ever imagined) I pull alongside the mooring ball and drop a couple of loops around it, using roughly the center of a dock line (dock line sinks), then pull the ends so the loops tighten against the chain beneath the ball. 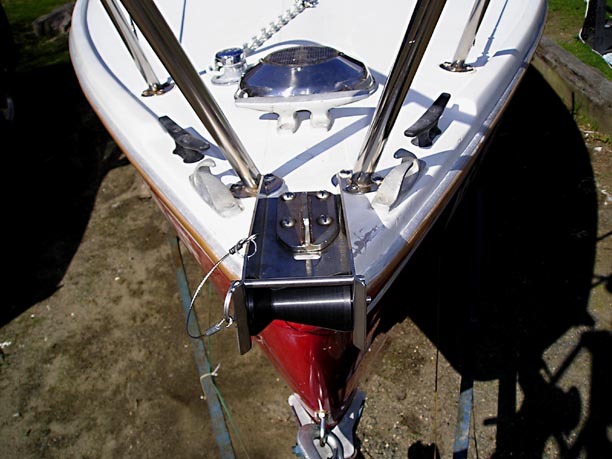 At the bow, I tie off one end on the port cleat, the other on the starboard cleat. When I depart, I loosen one end and let it go free, pull in on the other end until the line unwraps from around the ball and its mooring chain and is recovered. 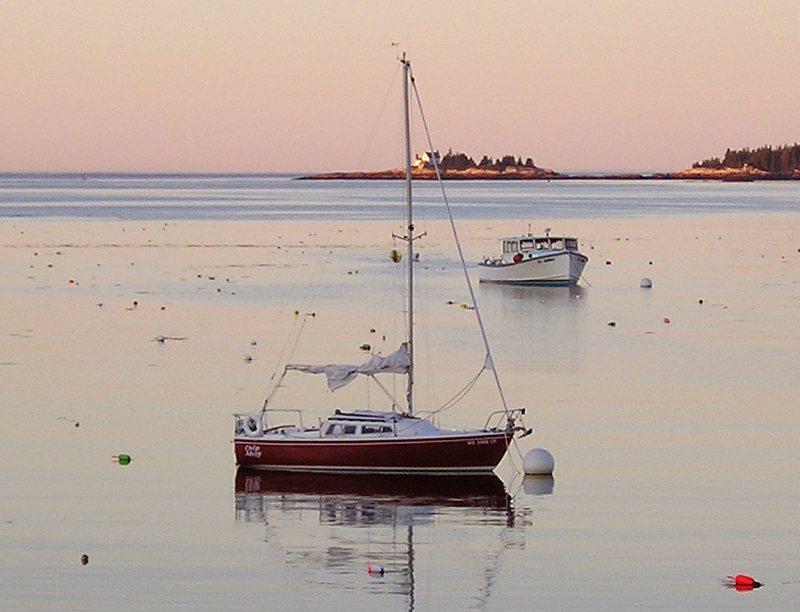 A few days after the Five Islands Harbor experience I tested this idea for the second time on another "bald" mooring, this time in Winter Harbor, Maine (photo below). Just to be safe I doubled up the lines in the event that one somehow loosened enough to slip over the mooring ball (again, dock line sinks). There was no slippage as tension, to one degree or another, is always on the makeshift mooring line. "Chip Ahoy" has skene bow chocks along with two bow cleats, and a bigger cleat just aft on the center of the deck, so I have room to run a second set of "pennants" if desirable. So far, I've found two lines to be unnecessary but perhaps for peace of mind: One seems sufficient.